Vacation with Doughnuts and Share a New Age Taste Experience. Every year for the last seven decades National Doughnut Day has been celebrated on the first Friday in June. This year is no exception. June 5 will be celebrated by doughnut lovers everywhere. Given the dramatic, inventive, creative happenings in the craft doughnut world paying homage on only one day a year doesn’t seem like enough. Nicola’s Donut Shop in Tampa makes decadent donuts for dessert. Therefore I am suggesting that family vacations include at least one doughnut day along with a bookstore visit of course. Just for the record I am not a habitual donut eater mostly because I ate way too many Krispy Crème Donuts when I was at university. 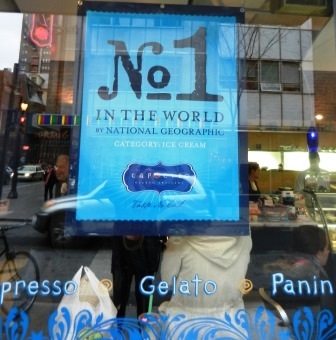 But times have changed and five-star urban eating experiences often include doughnuts or donuts if you prefer. In the last year I have visited several remarkable establishments and sampled outrageous doughnuts. While cake or raised, powdered or glazed is still the starting point, doughnut makers (many of them chefs) are creating flavorful often decadent options. New age choices include bacon and pineapple, gingerbread and caramel, sea salt and cardamom to some baked with artisan chocolates, and doughnuts topped with Oreos, Peebles, or Gummy Bears. Much like in an ice cream store the choosing may take some time. Add to the mix tasty gluten free and vegan choices and there is really no excuse not to celebrate any time especially on vacation. 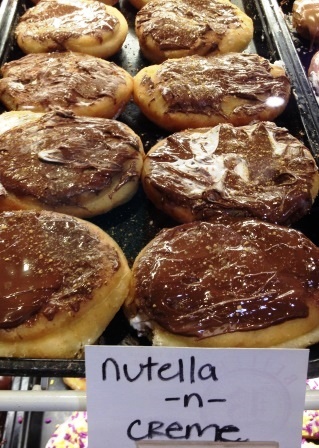 Beiler’s Bakery in Reading Terminal Market serves Nutella ‘n Crème doughnuts. No more explanation is needed. I am impressed with the amount of creative effort focusing on doughnuts. I am not describing all of my favorite selections but I am providing a nudge by naming a few of the very best doughnut spots in the country and thus reason to add a doughnut experience vacation plans. Beiler’s Hand Rolled Doughnuts in Philadelphia – Vanilla glazed donuts topped with M&M’s or Gummy Bears. Firecakes in Chicago – Maple-glazed doughnuts with pineapple & bacon. Hypnotic Donuts in Dallas – The first “Evil Elvis” yeast donut with peanut butter, bacon, banana and honey. A Baker’s Wife Pastry Shop in Minneapolis – Delightful classic cake doughnuts and exceptionally good American tea cakes. Revolution Doughnuts & Coffee in Atlanta – Salted caramel doughnuts topped with bits of charcuterie bacon. Donut Bar in San Diego – Home of the famous “Big Poppa Tart” donuts and made-to-order cinnamon French toast donuts with custard. Nicola’s Donuts in Tampa – Rocky Road, Brownie Brittle or decadent PB&J donuts for dessert. 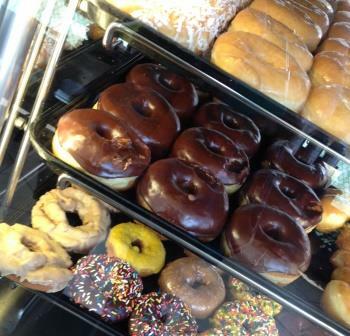 National Doughnut Day is all about personal choice. YUM YUM Donuts in Playa del Rey. Topping off the baker’s half dozen, cinnamon crumb donut holes and freshly squeezed orange juice. 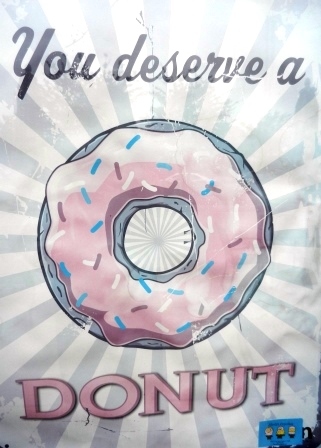 You deserve a doughnut any day but let’s celebrate National Doughnut Day this Friday for the fun of it. Make mine lavender glazed with sea salt. In the meantime if you have your own favorite doughnut (donut) shop or have discovered an outrageous new age flavor, please let me know.